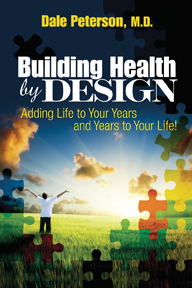 Would you like to learn how to Add Life to Your Years and Years to Your Life? Enter your Email address to receive Dr. Peterson's LifeXtension Course , a $497 value, free of charge. The Wellness Clubs of America was founded to teach you how to identify and address the root causes of illness. Our approach is based on years of research and is designed to add years to your life by helping you become virtually drug-free. Attend one of our workshops. Engage Dr. Peterson for your next speaking engagement. You may also schedule a personal consultation. You can explore Dr. Peterson's book by clicking on the cover to the right. To review chapter summaries click here. "Dr. Peterson is the most level headed, soft spoken medical doctor I have ever known. He has extensive knowledge from years of research on natural health support. He takes time with patients, the old fashion way. (yes, he is still licensed and practicing). His web site, www.drdalepeterson.com is an awesome resource. Check it out. He is an amazing man." "“You gave me a gift and renewed my hope. I have a clear direction I want to go.”"
"“This was a fabulous experience!! I feel I received much in-depth education to help me further understand so many things. I feel I am much better informed to be able to listen to others and help them with their challenges.” "
"I am alive today because of Dr. Peterson. I have had the fortune of being treated by Dr. Peterson and even at age 74 I have enjoyed wonderful health because of him. I had such severe eczema that my dermatologist prescribed high dosage cortisone shots. However, the cortisone weakened my immune system and I developed pneumonia. I didn't want to suffer with eczema, but I knew at my age that pneumonia could kill me. Dr. Peterson listened to my problem and began to treat me with an anti-fungal diet, teas and water. He pulled me out of it and I now have great health." "Dr. Peterson is a wonderful man. I trust him with my life. I'm an active massage therapist and plan on working until I'm 100. With Dr. Peterson's help, I know I can. I'm 79 going on 80 and my husband will be 82 this April. Both of us are medicine free and feel incredible. That's because Dr. Peterson is our doctor."